Blazing Target Acquisition. Peak Accuracy. There's nothing like a red dot for fast target acquisition and accuracy in dim conditions, and no one makes red dots like Bushnell. The TRS-25 1x25 red dot is engineered with Amber-Bright optics to help you quickly distinguish between a brown tree and a brown critter. Thanks to the scope's multicoated optics, hunters will have no problem seeing their target in low-light conditions. Other features include a 100-percent waterproof/fogproof/shockproof construction, a dry-nitrogen-filled housing, and a CR2032 battery. This sight can be easily used with both eyes open (eye relief is unlimited), increasing the shooter's awareness of the surrounding environment and providing faster target acquisition. There is no need for centering, due to the parallax free design in which the dot follows the movement of the user’s eye while remaining fixed on the target. The TRS-25 delivers full size performance in a sight with reduced size and low power consumption. The TRS-25 sight mounts easily on any Weaver style or Picatinny rail. An Allen style cross screw is used to secure the sight to the rail, and the clamping system provides adequate strength to keep it securely mounted. Once resistance is felt when tightening the screw it should be rotated no more than ¼ additional turn (over-tightening the screw may strip the threads). All red dot sights have an objective lens at the front of the unit that is spherical in shape. However, unlike a conventional riflescope, the objective lens in a red dot sight is positioned off axis and appears to be tilted when looking at the sight. This angle of the front lens allows the light generated by the battery powered LED light source inside the unit to be reflected back into the sight. The reflected light becomes the “dot” or aiming reference that the user sees when a red dot sight is switched on. This engineered “bending” of light is what makes today’s red-dot sights so popular and easy to use. Adhesive is used on the inside of the sight to secure the LED to the inside of the tube. By design, the led package intrudes slightly on the field of view. The TRS-25 utilizes a crisp, sharp red dot reticle. A control knob is used to adjust the red dot setting. A certain amount of resistance is designed into the control knob to ensure that the sight is not inadvertently turned on. The red dot may appear blurry if the dot intensity is set too high for the ambient light conditions. This is most likely to occur indoors with artificial, fluorescent lighting. The illumination control knob should only be set at the highest settings for use in bright ambient light conditions; for example, outdoors on a sunny day. An illumination setting that is too high for ambient light conditions typically results in a dot that appears distorted and non-concentric. For best results, increase the red dot setting until the scope gives the user an aiming reference that is perceptible but not glaring. The AR731306 versions of the TRS-25 are supplied with a "Hi-Rise" mounting block that can be used to position the sight at the correct height for optimum performance on an AR-15 style rifle with a flat top receiver. In order to use the riser block, first install the sight onto the hi-rise block. Ensure that the sight is correctly positioned and that the shaft fits into a groove on the block. To make sure that the shaft is firmly tightened, screw the shaft clockwise until a light resistance can be encountered. After that, screw another 1/4 to 1/2 turn. WARNING! Do not over tighten. Once the sight is installed on the Hi-Rise block, the entire assembly can be mounted on the weapon. First, loosen the mounting screw so that the clamp will fit over the tapered side of the firearm’s Picatinny or Weaver rail. Ensure that the tapered clamp on the riser is oriented with the chamfered (beveled) end of the clamp at the top. Ensure that the riser’s cross screw with nut is tightened to clamp it firmly to the weapon’s rail. Turn the large nut on the riser block ¼ to ½ turn with a coin, screwdriver or ½” wrench. WARNING! Do not over tighten. View More In Gun Sights. 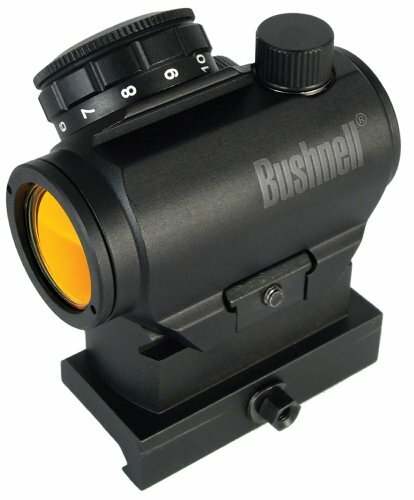 If you have any questions about this product by Bushnell, contact us by completing and submitting the form below. If you are looking for a specif part number, please include it with your message.